Hong Kong RC Sailplane Forum 香港滑翔機發燒友論壇 • View topic - Remember to turn on the receiver before launch!! Remember to turn on the receiver before launch!! Post subject: Remember to turn on the receiver before launch!! I witnessed the crash! 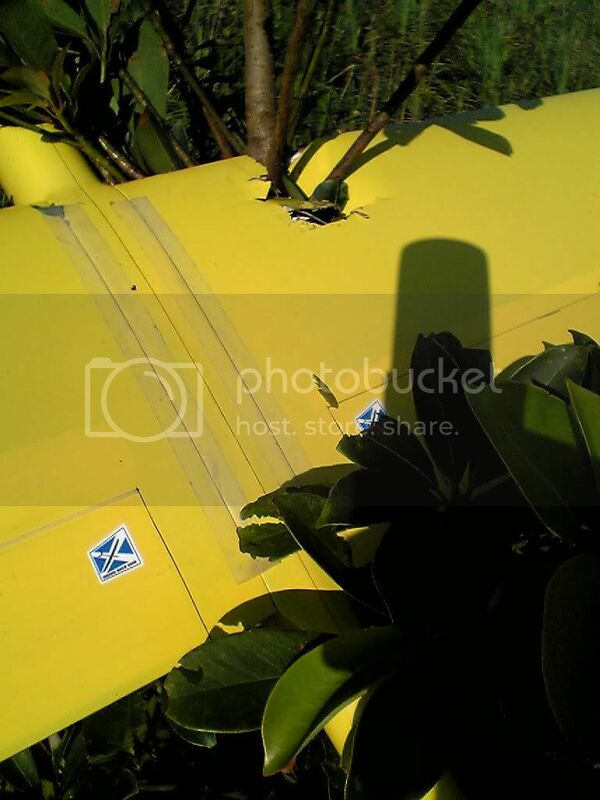 If we think positively, Ah Mak is lucky, because the tree stopped the plane on the slope. Otherwise, the plane would dive to Hollywood Plaza. At least, he picked up the reciver, and 6 servos. For other pilots who does not have a cross tail F3F plane, you need not to worry, as this kind of accident only happens on NYX F3F and Spider-X. The poor plane was Mak's Spider-X. I do not understand. Cross tail and forgot to turn on the receiver, what is the problem?? Well !!! It's just the Spider-X trying to tell me, it have a week leading edge. I was DSing on FNS East slope with the Spider-X, because the NYX-F3F had a leading edge damage on Saturdays DS session. It was running very smooth in the track, flying as fast as the NYX-F3F even without ballast. The condition was so good, the Spider-X had been flying round after round for hours. The Spider-X was very stable, even catching a grass on its wing tip at 100km/h didn't bring it down. However, problem started to show up on the other end of the radio! DSing without food for the whole afternoon, I must have gone a little out of mind. woke up as soon as the plane's tail go pass my fingers, but it was too late to do anything. Lucky I was, the Spider-X caught the tip of that tree just before it go pass the road. If it wasn't that tree, I have no idea where will the plane end up. Yeah Stanley, you are right. "鬍" is above the upper lip, whilst "So" is below the lips. Therefore, a cat could only have "鬍".